Helping someone with a hoarding disorder can be stressful and confronting no matter how you look at the situation. You don’t want to come off as rude or pushy, though you really can’t let the person stay living as they are. 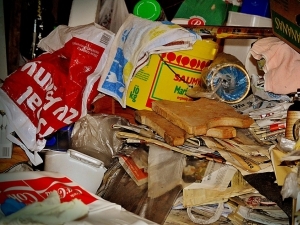 We’ll take a look at how to help someone with a hoarding disorder below. It might be surprising to know that up to 5% of Australians deal with a hoarding disorder and the majority of these people are senior citizens. It’s a condition that becomes far more common as we age, though it’s not untreatable. The first important thing to understand about hoarding is that it’s very rarely about the actual items themselves, but rather the memories attached. That means that when helping someone with a hoarding disorder you should focus deeply on the emotional aspect, rather than the clutter. It’s important to know that many items, even ones that could be considered trash, often hold deep emotional connections and sentimental value for sufferers. That means you might notice many ‘pointless’ rubbish items sitting around including rappers, packaging and even food. As the hoarder becomes more and more attached to items, they will build up their clutter to a point where they simply can’t fit any more of it in their home. Eventually, most people suffering from hoarding disorder cannot move around their homes and are confined to one or two rooms. Moving on to helping, you’ll soon realise that helping out a friend or family member with hoarding disorder can be very frustrating and might seem impossible, though you have to be strategic and committed to the process. To reduce feelings of anger, resentment, stress and even confusion, you’ll need to be exceedingly understanding and explain that there is no judgment. Let’s take a look over our five tips for helping someone overcome their hoarding disorder. The whole process is so much more than hiring a removal service and throwing all the clutter away. In fact, doing this could be so deeply scarring for the person they might emotionally spiral. You must focus on the sufferer first. Sit down with them in their home, or go out for coffee or lunch and explain to them that you’re here to help and you understand that the attachment to the clutter is an issue that can be overcome. An emphasis on non-judgment is vital. No one wants to feel like they’re being helped simply out of frustration of embarrassment. It’s common for someone suffering from a hoarding disorder to be isolated and ashamed. Don’t let them feel this way. Keep on a happy face, be relentlessly positive and show them with your language, expression and actions that you truly don’t see the situation as embarrassing. The sufferer needs to know that you understand their hoarding is not who they are, but simply a difficulty they are dealing with. Once your friend or family member is ready to get going on the decluttering and their recovery, you’ll have to start the planning. That means drafting up a cleaning strategy, hiring a rubbish removal service like 1300 Rubbish and finally setting goals. Be prepared for the first few days to be difficult. It might take an hour to convince your friend or family member just to throw away a sheet of paper, though parting with anything is a sign the process has begun. This tip is essential. No one likes being bossed around and told what to do and even more so if they have a hoarding disorder. During the clean, you really do need to take a step back and let the sufferer lead the way. Simply ask them for some guidelines and don’t overstep. Don’t suggest this right away, but once a sufferer has begun cleaning and focusing on their recovery you should suggest some sort of professional help. This way they will be on the road to getting better and can more clearly focus on cleaning up their home. Behavioural therapy is one of the best ways to help support someone with a hoarding disorder and will allow them to move past the issue in a short period of time.